Ungrateful Newlyweds Are Just Selling Your Gifts Online. Revolt! Actually, after looking at this list of gifts couples were given to celebrate their most precious union — a wrapped banana, a "bad oil painting of [their] cats" and a meerkat garden ornament — I'm starting to think these newlyweds are doing the right thing. If you haven't already given up on picking the perfect present for your friends and started just handing over envelopes filled with cash, you're now officially doing weddings wrong. According to a survey conducted by One4all, a British gift card company, 82 percent of newlyweds admit to selling their wedding gifts online on sites like eBay. BETRAYAL? Or PERFECTLY ACCEPTABLE? Newlyweds Don&apos;t Want Your Stupid Presents. They Want Cold, Hard Cash. Or maybe it's perfectly acceptable betrayal — fully 20 percent of people surveyed said they expected their gifts will be unused, returned or even sold. There's something to be said for that sort of romantic pragmatism. It's not like people looooove shopping for wedding gifts — according to the survey, forty-two percent of folks say that buying gifts is "stressful". 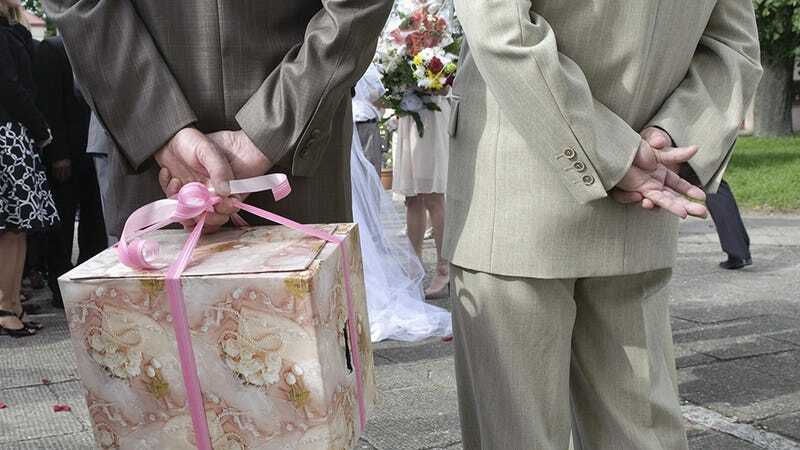 On top of that, twelve percent of guests said they have been embarrassed by gifts they've given to the bride and groom. We know Mr. Marshmallow Fluff isn't included in this, but that must be a crap feeling. Like, "Here, enjoy this garbage; I don't know why I bought it and I'm embarrassed to even sign my name to the card. Good luck with your marriage!" However, one newlywed's junk might be another bargain-hunting cheap-asses treasure. I once purchased a gorgeous orange Kitchen Aid mixer on deep-discount that still had a wedding note attached. Mazel Tov!